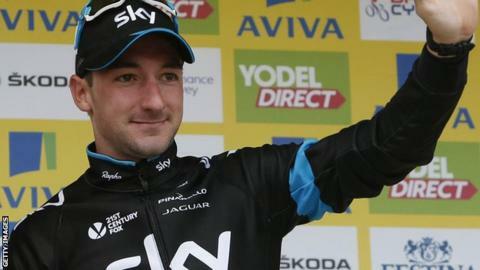 Team Sky's Elia Viviani won his second stage of the Tour of Britain as Petr Vakoc crashed in stage three to hand the yellow jersey to Juan Jose Lobato. Italian Viviani, 26, won in a sprint finish in Kelso, Scotland, despite having no team-mates to lead him out. Viviani, a stage winner at this year's Giro d'Italia, had already taken the first stage of the one-week race. Czech Vakoc of Etixx-Quick Step crashed towards the end of the 216km route from Cockermouth. That allowed Spanish Movistar rider Lobato to move into the overall lead, 10 seconds ahead of Norway's Edvald Boasson Hagen. Britain's Owain Doull finished in the sprint group to keep within 14 seconds of the overall lead. The 22-year-old Welshman is riding with Team Wiggins, the outfit set up by 2012 Tour de France winner Sir Bradley Wiggins, who is using the Tour of Britain as preparations for his European Track Championships and Rio 2016 campaigns. Wiggins himself came in 72nd and is 23mins 47secs off the leader. The race finishes on Sunday, 13 September with a multiple-lap circuit around central London. "After two up-and-down days, Tuesday's northward ride to Kelso always looked like it might provide some respite in terms of difficulty but, as is increasingly the case at the modern Tour of Britain, that respite is relative. "With the best of the British scene desperate to impress against the big guns of the World Tour, the racing this week has been far from straightforward and today was no exception. "Yes, Team Sky's Elia Viviani won a second bunch sprint in three days, but it took a huge effort from his team-mate Ian Stannard to reel in a determined group of breakaway riders, and even then the Italian profited from World Tour rivals Lotto-Soudal making a mess of the finale. "But the real loser on the day was Monday's winner, young Czech rider Petr Vakoc, who crashed to lose his race lead, injuring his hand in the process. "To make matters worse, his Etixx-Quick-Step team-mate Mark Cavendish was delayed by the pile-up, too, and rolled in three minutes behind Viviani looking very disgruntled."